After a couple of weeks of cooler but very rainy weather, it appears that we are going to enter another segment of hot and dry weather. The water has been plenty warm already but maybe we are far enough into the summer that it won't heat up too much more. The story of saltwater fishing right now is cool rainwater storming down the rivers and running into mats of sargassum weed that has blown inshore from the Gulf Stream. As these opposite forces sort themselves out, the fishing was trying to move into a late summer setting but will probably be slowed down if the heat stays around for a couple of weeks. As it has been for a while, flounder are the largest part of the inshore catch right now. They are around almost any structure, where they can hide and ambush unsuspecting prey. Mud minnows, finger mullet, peanut pogies, and assorted strip baits have all been working well. The trick with flounder is to wait until he has the bait all the way in his mouth before attempting to set the hook. Assorted sizes of red drum are ready to ready to attack your baits along most of the inshore coastal waters. I have to say drum rather than puppy drum, because they are ranging from 16 inch long rat reds up to 35 inch bulls. On the high tides, particularly the full moon high tides, you can see the grass moving as they work their way through the flooded marsh. Occasionally you will even get a glimpse of a copper back or shiny tail breaking up out of the shallow water. Gold colored weedless spoons and soft plastics are the best artificial baits, while a frisky finger or corncob mullet will really get a drum's attention. Speckled trout action is slowly picking up, especially around the edges of Pamlico Sound. Reports have been improving from both the mainland side and the outer banks. If you can work a Mirrolure, the trout will reward you by striking. Otherwise, one of the soft plastics will probably serve you best. I really like the versatility of curltail grubs. Tarpon are still being caught in the lower Neuse River and western Pamlico Sound. These are daytime fish that are replaced at night by large red drum. Fish the tarpon deep and the drum in the middle depths. As the moon fills back out the tarpon of Bald Head Island and the lower Cape Fear River will get more active. In contrast to the Neuse-Pamlico tarpon, the Cape Fear tarpon like to feed on moonlight nights. Here again, flounder are the most prevalent catch. To the north of Cape Hatteras, there have been some good catches of sea mullet (whiting) and gray trout. In the middle NC Coast, pompano and spots are both pretty common catches. Below Cape Fear, there have been some excellent catches of speckled trout. The secret is live shrimp, fished just off the bottom, in the very early morning and very late afternoon. The piers have also been catching some kings and larger spanish mackerel out near the ends. Fishermen at Bogue Inlet Pier, in Emerald Isle, have been flirting with tarpon and have even managed to land a few. Most just steal the bait, jump a few times, and take off. The small treble hooks, on a king mackerel rig, are no match for the hard jaws of a thrashing tarpon. The amount of loose sargassum weed has made ocean fishing difficult, but there are still some spanish and blues sifting through the weeds for a meal. There are more reports almost daily regarding catching some king mackerel near the beaches and inlets. This hasn't really fired off yet this year, so it is due to take off at any time. If the grass would go away so it would be easy to fish, I believe that we would find this area of the ocean to be very productive. From about 60 to 120 feet, there are consistent reports of many species of fish. King mackerel are the headliner of this group. The large kings have spread out a fair amount, but every day there are good reports of smaller ones. The most unusual visitor to these waters is african pompano. 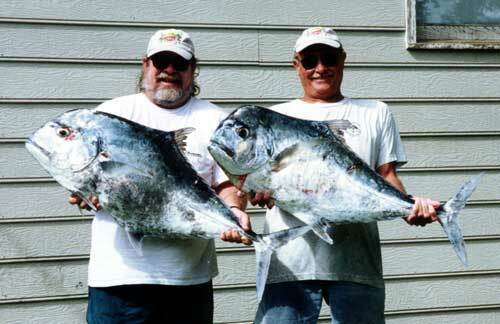 These huge pompano have been fairly regular visitors to NC since Hurricane Bertha in 1996. Right now, they are at Frying Pan Tower and should be around until about Labor Day Weekend. Large live pogies are the premiere bait. Live bait outfits to tuna tackle will all work for these bruisers. They have the speed of a king, in shorter bursts, and the strength of an amberjack. They taste good too--------What else could you want? Capt. Bob Black with a large african pompano taken near Frying Pan Tower on July 29, 2000. The pompano hit a drifted live menhaden. Capt. Jerry and Capt. 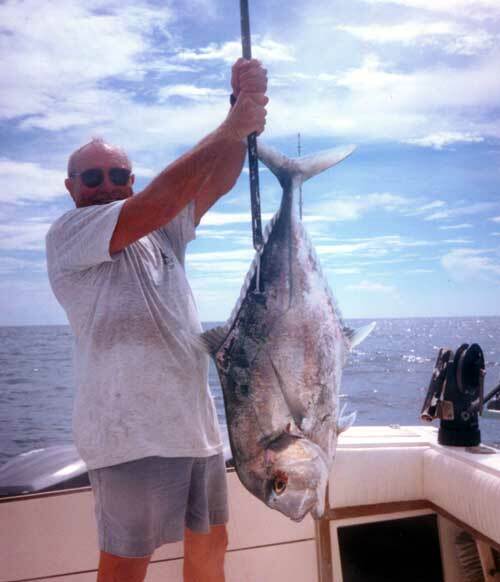 Bob Black with a pair of nice african pompano. This is the 5th consecutive year that a concentration of these fish have visited the NC Coast. Dolphin have also moved into these waters. These are mostly smaller dolphin, but a few genuine gaffers are almost always in the mix. Wahoo and sailfish are also surprising anglers in the mid-depth waters. The sails are attacking lures and live baits, then dancing their way across the waters. I like the wahoo best. Wahoo put on a burst of speed that makes a reel howl like nothing else. They have been moving into these waters and creating major adrenaline rushes. Kendall Hocutt with a 37.5 Wahoo caught off Topsail Beach on the A-One-A with Capt. Charlie Watson. Gus Villanova with a 40 pound Wahoo. fish were caught on salt water Rebel lures within one half mile of AR300. Rather than a no-man's land, this area is almost like an any-man's land. Be prepared for anything while fishing in here. Even marlin are not out of the question. While dolphin continue to be the largest part of the offshore catch, some others are working their way back into it. Hopefully the extra heat, of the next few weeks, will not change that pattern. A summer visit of 40 to 60 pound yellowfin tuna has been a real treat. The majority have been from the Big Rock to the north, but boats around the Steeples and Blackjack Hole have also caught a few. In the past few days more wahoo have shown up in the Hatteras daily reports. Elsewhere the wahoo seem to be moving to the inshore edge of the Gulf Stream and sometimes even inshore of that. 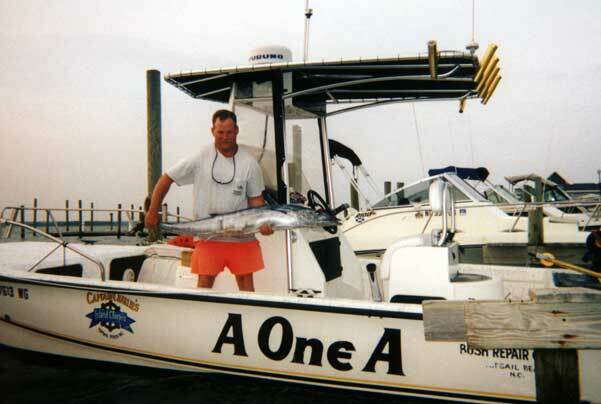 I have even heard of one that was caught on one of the Topsail Beach artificial reefs. I have a story regarding the where's and when's of king mackerel fishing, that will be out in the September "Carolina Adventure" Magazine. It should be delivered and in the news stands by August 21. Get one and check it out.